Albert Camus, celebrated author of those high school World Literature course staples The Stranger and The Myth of Sisyphus, would have been 100 years old today. While Camus is normally classified among the giants of 20th-century continental literature, I would argue that he could equally legitimately be considered a Francophone African writer. He was, after all, born in Algeria, and lived there until he was nearly 27 years old. Camus’s first collections of essays were initially published in Algeria, and most of his late novels were set in North Africa. Perhaps befitting his intercultural status as a pied-noir (that is, a person of European descent living in French North Africa), Camus wholeheartedly embraced this notion of the halfway. His decision, however, often meant that he had to blaze his own trail, and consequently expose himself to strident criticism. During the Algerian War, for instance, Camus famously refused to support the cause of Algerian independence and did not condemn outright the atrocities committed by French soldiers. 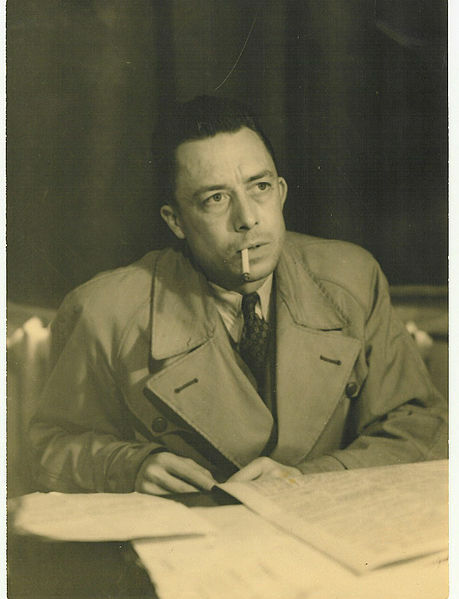 Though Camus vocally opposed the violence of war in all of its forms, and wrote frequently about the suffering of native-born Algerians under French colonial rule, he could not bring himself to reject the pied-noir community that had raised him. Algerian resentment over the perceived offense lingers to this day. But more than anything else, there is the silence of summer evenings. Does the Algiers in me need any special signs or sounds to embrace these short instants where the day tips into night? When I’ve been away from this land for a while, I imagine its twilight as a promise of happiness. On the little hills that dominate the city, roads wind through the mastics and the olive trees, and it’s to them that my heart returns. I see gatherings of black birds rise above the green horizon. In the sky, suddenly emptied of its sun, something unwinds: masses of red clouds spread out until they are reabsorbed into the air. Just a moment later, you see the first star begin to form and harden in the thickness of the sky. And then, all of a sudden, the night, all-consuming. These fleeting evenings in Algiers, what unique power do they have to unravel so much within me? This sweetness that the evenings leave on my lips, I don’t have time to tire of it before it has already disappeared into the nighttime. Is this the secret of its persistence? The tenderness of this country is devastating and stealthy, but in the instant that you find it, your heart, at least, is entirely devoted. Image credit: Albert Camus in 1957 by Robert Edwards. Creative Commons License via Wikimedia Commons.